On this page we gather PINK jewelry and handbags! We have pastel pink to hot pink, pick your soft or sizzling favorite! 1-5/8 inches long on sterling earwire, 3/4 inch across. Background round disk is speckled peachy salmon pink over rose and gold. Etched cutout swings on top in silverish metal with design like broad leaves or starfish, with small iridescent glass cabochon. 1-7/8 inches long on sterling earwire, 1/2 inch across. Metal haped like a graceful flame, vibrant fuchsia rose has a metallic rose bead swinging in the center. 1-3/4 inches long on sterling earwire, 3/4 inch across. Magenta pink metal has lacy cutout pattern in an exotic Moroccan-inspired teardrop shape. 1-7/8 inches long on goldfill earwire, 3/8 inch across. Bands of pattern in cutouts are colored berry pink. 1-1/4 inches long on goldfill earwire, 3/4 inch across. Lacy cutouts are slightly domed, colored pale peach and deep rose. 1-1/2 inches long on sterling earwire, 7/16 inch across. The metal is colored in subtle pattern of bright and light rose, silver flourish swings on top. Rich with color of glasslike jeweler's resin, this bangle has oval shape, hardware in gold vermeil (18kt gold over sterling). Hinged for easy on-off (hinge stays under wrist), and magnets in the ends help keep it closed. Measures 2-3/8 inches across, 1-3/4 inches deep, for small to medium wrist. 1/2 inch wide and rounded top surface. The color is translucent bright fuchsia rose pink. Rich with color of glasslike jeweler's resin, this bangle has oval shape, hardware in gold vermeil (18kt gold over sterling). Hinged for easy on-off (hinge stays under wrist), and magnets in the ends help keep it closed. Measures 2-3/8 inches across, 1-3/4 inches deep, for small to medium wrist. 1/2 inch wide and rounded top surface. The color is translucent light salmon pink, or pink coral. 1 inch square earrings, CLIP ON style for all ears, designed to be worn straight at angle shown. 1 inch square with surgical post 3/8 inch below top edge, to be worn at angle shown. Graceful teardrop is 1 inch across, 2-1/4 inches dangling length on surgical earwire. 1 inch round earring has surgical post 3/8 inch below top edge. 25 inch long necklace has goldplated toggle clasp in back. At center are a trio of polymer clay pendants, 1-7/8 inch tall at middle, surrounded by vintage Czech glass and seed beads, porcelain and Swarovski crystal. 1-7/8 x 1-3/8 inch oval pin has horizontal barpin clasp to wear at angle shown. 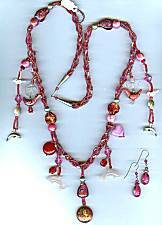 By The Artful Soul, necklace set in deep raspberry/rose pinks. The necklace is 4 strands of frosted glass seed beads that are braided together into 28 inch long piece. Between the braiding are larger bead clusters of ceramic and foil glass, sterling silver balls, Swarovski crystals. Fringe in asymmetrical interest (left and right are different but nicely balanced), has charms of birds and dolphines, wood, shell, rose quartz, sterling silver, lucite, Czech glass, cloissone. Sections are knotted and sealed on nylon cord, sterling hook and end caps in back. 1-5/8 inch long earrings of Czech glass and crystal, surgical steel earwire. By The Artful Soul, this is part of a soft pale pink geometrics polymer clay collection, powder and light rose pink, hint of coral pink and ivory. Detailed handbuilt patterns are sliced and mounted onto background clay, accented with silver leaf, then fired. Light and artful. 30 inch long necklace has silverplated toggle clasp in back. At center is 2-1/4 inch pendant of polymer clay. There are 7/8 inch flat round 2-sided polymer beads midway up each side, strung with all shapes of beads that include rose quartz, rhodonite, vintage Czech glass, Swarovski crystals and see beads. 1-5/8 inch pin has barpin clasp. Tiny glass seed beads on wire are gathered into petals and cluster at center to form a flower-shaped pin. The wire can be bent into desirable shape, it is secured in the back to a small fabric patch. Barpin clasp is sewn onto that securely. About 1.75 inches across, the colors are pale pink, dark rose and pearl. Fair Trade product made in Nepal from Aid Through Trade. 2 inches long on niobium earwire, 5/8 inch across. Rough nugget of ROSE QUARTZ in lovely light pink is captured by silver wire and dropped from dimpled silverplated ring. These earrings a bit heavier than most because of the size of the stone (0.5 oz for the PAIR). 2 inches long on goldplated earwire, 1 inch across. The brass squares set a diamond angle, are etched into sparkling design with dark berry pink finish. 7/8 x 1-1/8 inch metal oval has etched dimple pattern on it and painted wash of orchid/rose color enamel, suspended from sterling earwire to 1-5/8 inches long. 1-1/2 inches long including sterling earwire. A cutout brass shape in form of lotus blossom is colored in bright rose pink, about 3/4 inch across. 1-1/8 inches long including sterling earwire, 1/2 inch across. Open flower motif has bright fuchsia rose pink color on it, tiny crystal dangling below. 2 inches long on sterling earwire, 9/16 inch across. A trio of graduated round metal disks have snowflake pattern embossed on the surface, rose pink enamel washed across them. 1-5/8 inches long on sterling earwire, 1-1/8 inch across. Cutout teardrops form rays within a large circle disk, colored deep rose pink color. 1-1/8 inches long including sterling earwire, 7/16 across. Frosty lavender-pink square swings freely on top of zig-zag bordered nickel color square.